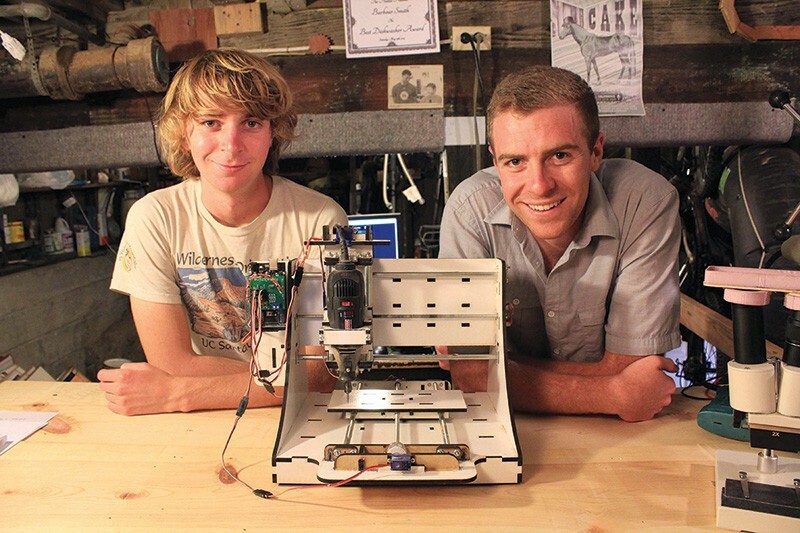 WE BE 3-D Bar Smith and Thomas Beckett's Kickstarter goal for their router was $10,000; they received $80,000. 'It's so transformative to design something on the computer, and then be able to make it into a real object," says 23-year-old Bar Smith, inventor of what could be the world's most affordable CNC router. Operating like an automated sculptor, Smith's CNC (computer numerical control) device allows people to carve items out of raw materials like wood, plastic, foam and brick after they've designed the desired piece on a computer. Similar to a 3-D printer, which lays down materials and builds pieces from the ground up with lasers, a CNC router uses metal bits to whittle material into the desired shape. The router can create both two- and three-dimensional pieces, "so there is an unlimited number of things you can make," says Smith, who moved to Guerneville after graduating from UC Santa Cruz this year. The desktop device could be used to carve phone cases, chess boards, nameplates—just about anything from material soft enough that it can be cut and small enough to fit on the machine's working surface, Smith says. Smith's router costs less than $200, putting it at a tenth of the price of machines with similar capabilities—a big accomplishment for a 23-year-old and his friends. The invention has been met with global enthusiasm, and in May, Makesmith CNC (the start-up Smith founded with Thomas Beckett), garnered 800 percent of its Kickstarter funding goal. That's a long way from a couple of years ago, when Smith, a Mill Valley native, was a soft-spoken engineering student with shaggy blond hair who wanted to turn computer models into physical objects. His budget, Smith soon found, was too tight for the ambition. The story of how he ended up with $80,000 to distribute his invention to engineers, hobbyists and designers is a testament to patient perseverance. As he searched the internet a couple of years ago to research his project, Smith realized he would have a hard time affording the parts to build the machine he wanted, let alone purchase a fully assembled device. The budgetary confines forced him to economize on his project in a way pro designers are not familiar with, he says. Given Smith's modest financial means, many people, and even some professors, scoffed at his idea to build a CNC router, Smith recalls. He brushed them off. "Anytime you're doing something that no one's done before, people just assume that it hasn't been done because it can't be done," Smith says. "In the first year, I thought, 'Well, I probably can't build the whole machine, but I can at least prove that I was right about this specific part being possible,'" Smith says. "And then someone would be like, 'Well, this next part won't work.' And I thought, 'OK, well, I'll make that part work just to win that argument.'" As Smith worked, he realized he was getting close to a fully built homemade CNC router. He plowed on and finished the job, and figured he would build routers for himself and a few friends. "Then I thought, 'Well, maybe we should do a Kickstarter—then we could make a lot of them,'" Smith says. Smith consulted Beckett, his housemate and fellow student at the time, and the two sketched out a business plan. One morning, the partners posted a listing on Kickstarter and set a $10,000 goal to fund the purchase of two laser cutters. Beckett then went to work. "I got back nine hours later and our project was funded," Beckett says. The Kickstarter campaign eventually attracted 400 backers from about 40 countries, who contributed more than $80,000. Two weeks ago, the partners picked up a pair of laser cutters at the port of Los Angeles. Now they're geared up to manufacture CNC router kits and ship them to Kickstarter backers who pledged $195 and up. "We're trying to keep up with the people who want [the router]," says Justin Beirold, a former Cabrillo student now at UC Berkeley who is also doing marketing for Makesmith. "At this point, we're not even trying to attract people to our product," says Beirold. "Right now, people are just coming to us, like, 'This is awesome, I want one!'"